It really does come down to games, Dominos or not. This afternoon is my writing time. I’m sitting at a table against the wall under the lamp shade so I have light to type by. I just finished two Americanos, light on steamed milk. 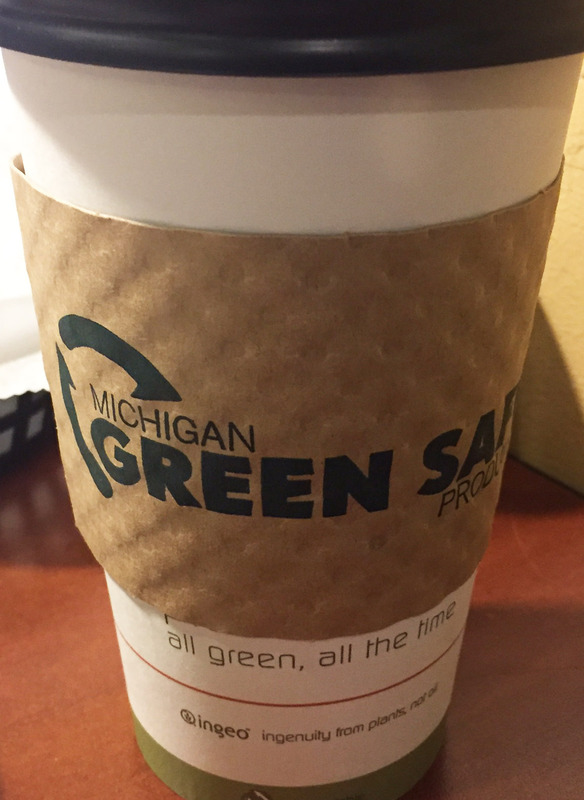 The first Americano had a smidge of gingerbread syrup to spice up the holiday season, and the second was just straight up. You’d think I was a serious coffee drinker, but, really, I’m just a novice who latched onto some impressive-sounding coffee name. I feel like I belong here. I’m gathering my laptop and notebook to leave when a guy and a boy walk in and sit at the small circular table by the window. From what I overhear, he seems to be a Big Brother to the 13-year-old 8th grader. I’ve got plenty of room on my rectangular table for everything I have, so I stop packing up and pull out my journal to record the moment. BB leans forward and asks, “How’s the relationship with you and your brothers?” That’s what makes me think Big Brother in the first place. That and the time is now 3:30pm, which is just after school. I overhear BB say he likes that the boy plays Minecraft, that “…it’s a game that requires you to work as a team.” I don’t know the game, but I feel like I should. I’ve heard it enough in pop culture media. Note to self: look that up. Now BB teaches the boy how to play Dominos. This is significant because last night I watched my Season 2 DVD set of Major Crimes. The last episode I saw is what I call the Lost Horizons episode. Tim Conway plays the episode’s main character, Howard. In one scene, he flirts with the female lead, Capt. Raydor, mentioning Dominos. At the same time, in another room, Lt. Provenza questions someone else who talks about Dominos. So here I am, watching BB teach the boy to play. I don’t know how to play Dominos, actually. I know how to match numbers but not the rules of scoring. I also know how to stack them in a row so they all fall down. Who plays Dominos? I half listen as I write and half watch without trying to stare directly at them. I want to hear BB explain how to play. The big window gives me an excuse to look in that direction. If we accidentally make eye contact, I can glance over at the bike chained to the tree or the church across the street or the cars driving by on Center Street. I could even turn my head to the left and stare at the long, roomy wooden table that divides the coffee shop into thirds. 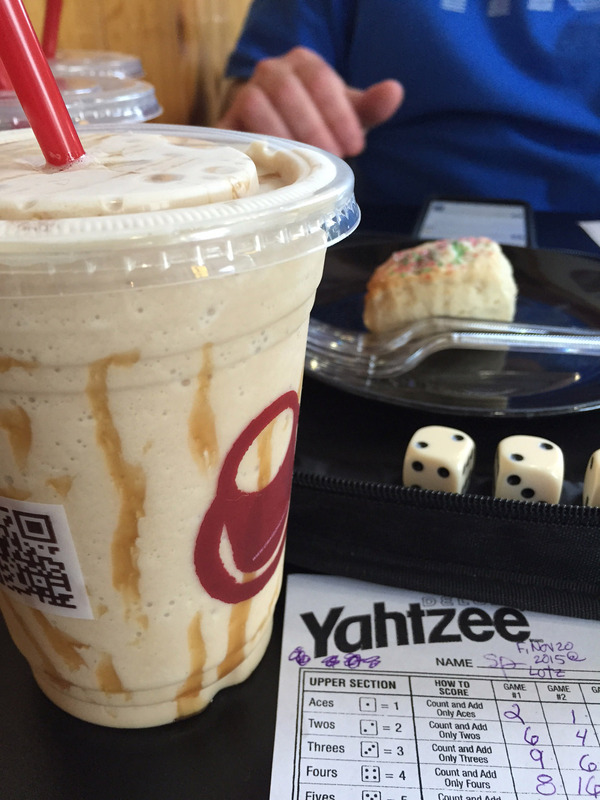 My husband and I play games in coffee shops, usually Yahtzee in various Starbucks. It’s a Travel Yahtzee game we, ironically, bought at Starbucks a few years ago when they promoted toys and activities among their products. We have Travel Scrabble from that time, and we’ve bought other portable games through the years. These are our “date nights” because we get out of the house, spend time together and drink coffee. A long table like that one would be roomy, but distant. We choose cozy tables like this one I’m at or the one the guys are sitting at now. I miss any Dominos explanation over the mellow music playing overhead, but the discussion of games continues. BB: “I wasn’t good at Tetris when I was young.” Now I have a frame of reference of the guy’s age. He’s a child of the 80s. Thirteen years old and introduced to coffee. That’s our society today. BB and boy wrap up their visit and pack up the chunky white tiles into a snap-close metal box. I never hear how to play Dominos, but the game box looks like it was the original BB had as a younger guy. I’ve seen some people play games in coffee shops. Last week, at Miracle Coffee, two women had a pile of board games, they looked old, worn and well-loved. Gathering their games up when we arrived, they saw us pull out our Travel Yahtzee. We all got talking about board games. They may have mentioned that there is a Triple Yahtzee game out there, a game I vaguely remember, like maybe I had it as a kid. Maybe I still have it. I’ll look through my childhood toy box in the basement. Classic board games have become “the thing” these days. The box designs look retro, but they’re all too new, looking fake. I believe in using authentic items. In scrapbooking, I use the real photo, scan a copy if it’s precious and irreplaceable. In mixed media art, I incorporate real tickets, tea bag tags, and cancelled stamps. Because of this, I prefer original game boxes that hold the authentic game. Games are a good thing, old or new, especially if they bring us together. Diana, a lawyer and his client should know better than to discuss their case at Panera, when there is a writer in the adjacent booth. That’s all I’m sayin’! Diana, Sounds like the beginning of a coffee series—a different drink and a different eavesdropping. Fun. Enjoyed your piecing it all together. I love where this is going. It should be a great adventure.